Some Michelin starred restaurants try hard to be ‘cool’. That isn’t the case with Gabriel Kreuther’s self-titled eatery. Located within the footprint of the Grace Building, this cream-colored and sturdy establishment goes big on the ‘traditional’ theme, with definite nods to the rural way of living and eating. That’s no coincidence or surprise; Gabriel Kreuther himself hails from the Alsatian farm country. Kreuther is a chef who ‘paid his dues’ before opening an establishment in his own name. He served with Danny Meyer at the Modern for a full decade, honing his craft and developing his style. 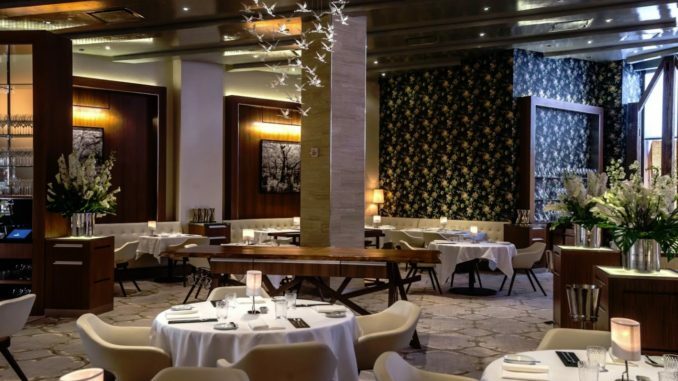 Indeed, if you’ve ever dined at the Modern you may have encountered some of his signature dishes before; the sturgeon-sauerkraut tart comes highly recommended for guests making bookings in the dining room at the rear. You wouldn’t expect the menu to just replicate what’s on offer at the Modern, though, and it doesn’t. You’re unlikely to find anything like the croustillante sautéed foie gras, which comes wrapped in cabbage and feuille de brick, anywhere else. If you do, you’re even less likely to find it done as well. Expect little samples of home-made bread between courses, too. It’s hardly shocking to find a baguette in a French restaurant, but you probably won’t appreciate the artistry of making a baguette well until you’ve tasted Kreuther’s recipe. Although the restaurant does open for an afternoon service, you’ll want to arrive between 5.30pm and 10pm to enjoy the full menu, which comes with a reasonable cost of $155 prix fixe in return for four unforgettable courses from a French master.